Lift-out model scenery is a very useful way of creating an access for hidden tracks on your model railroad layout. If you have trains going through tunnels, or if you have different levels of tracks with trains going over and under each other, you almost certainly have hidden track areas with limited or no access. 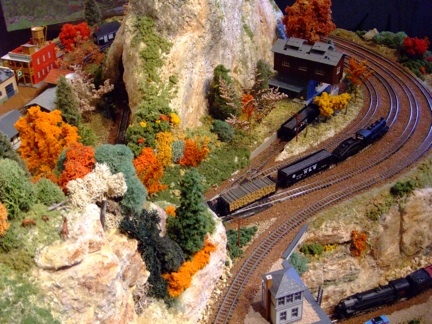 With lift-out model scenery, it would be easy to “lift out” a mountain, for example to get at the tracks underneath for cleaning or to remove wreckage or fix a derailment. After you’re finished you can then replace the scenery so that the lift-out section won’t be noticeable at all. •	Make a template - Put a large sheet of paper or newspaper over the opening that you wish to cover with the lift-out section. Use a felt tip pen to draw the edge of the opening on the newspaper. (If your lift-out will be placed on top of risers that surround the opening, make the template an inch larger than the opening so the lift-out will have something to sit on.) Then cut out the template with scissors. Check the fit of the paper over the opening. •	Cut the foam board with a sharp hobby knife after drawing an outline of the template on the board. Again, check the fit to be sure it’s what you want. •	Now you can build a mountain, rock formations, forests, or whatever addon scenery you want on top of the foam board using any of the methods described in the Terrain page of the Scenery section of this site. My favorite method would be the newspaper wads covered with plastercloth. You have the option of doing this at your workbench rather than on the layout if you like. Make sure the scenery on the lift-out is extended all the way to the edge with no white foam board visible. •	Once your scenery is finished, place the lift-out back in place on the layout. Use underbrush, vines or foliage to hide the edges of the lift-out. Make sure you use something here that would be easy to put back in place if the scenery gets slightly disrupted when you put the lift-out back in after it’s been removed. From "Lift-Out Model Scenery" to "Model Train Scenery"
From Lift-Out Model Scenery" to "Homepage"